I. Introduction: European apple sawfly (EAS) is a type of primitive wasp that is an apple pest mainly in the northeastern states. Its range has been extending through eastern Pennsylvania by Larry Hull (PSU) in recent years, and in spring 2000 was found in the Kearneysville area of West Virginia by Henry Hogmire (WVU) and Mark Brown (USDA-ARS). 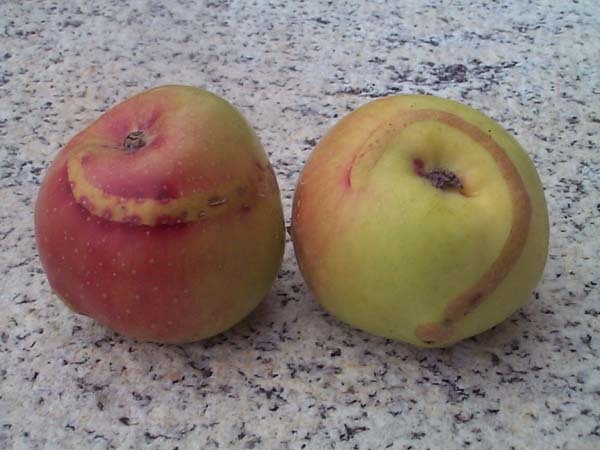 In 2003 and 2004,EAS was found in Virginia using white sticky traps and in damaged fruit in Frederick, Loudoun, Rappahannock and Fauquier counties. This work was supported by CAPS. IV. Biology: Mature larvae overwinter in the soil. Pupation occurs in the spring and adults emerge at the pink stage of bud development. Males and females each feed on apple pollen. Females oviposit in the developing fruit. The female makes a slit and deposits an egg near the calyx of the young fruit. The larva mines just under the skin of the apple. After developing in the fruit, the mature larva leaves the fruit to enter the soil for the winter. V. Injury: The tunneling by the larva creates a large russeted scar forming a circle, often originating from the calyx. 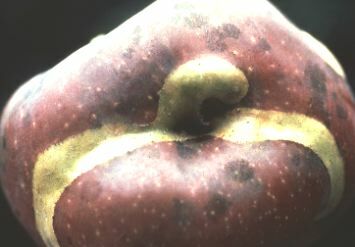 A single larva may leave the first fruit and tunnel to the core of a second or third fruit. Frass may be found protruding from the injury. Frass is wet in appearance, as opposed to dry in the case of codling moth or oriental fruit moth. Fruit with such core injury are likely to abscise in mid-summer. VI. Monitoring: Traps similar to those used for monitoring the TPB in apple, non-UV reflecting white sticky rectangles, can be used for EAS. The trap density is the same as for TPB (one per 3-5 acres; 1.2-2 ha). Also traps are concentrated near the orchard periphery. There are some differences in trap placement height and date, however. Hang traps for EAS at pink, on the south side of the tree near head height in the periphery of the canopy. There should be an area of about 12 inch (30 cm) radius cleared of foliage, but aside from this cleared area, a high concentration of blossoms is desired. Monitor traps weekly. Research in Massachusetts has developed two action thresholds for EAS, depending on whether a prebloom insecticide spray has been applied. If a prebloom insecticide application has been made, use a threshold of cumulative captures from pink through petal fall of 5.5 adults. If no prebloom spray has been applied, use a cumulative capture of 4.7 adults. Use caution with these thresholds however, supplementing data with fruit examinations. See the factsheets on EAS from Cornell for more information (both have links to photos of adult).